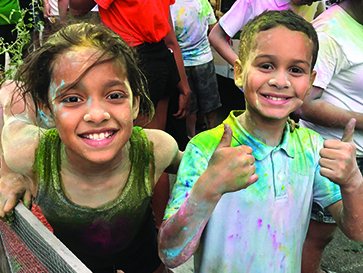 This summer, Boys & Girls Clubs of Boston members beat the heat with fun activities and adventures in and out of the Clubs. From Fenway Park to a local farm, and everywhere in between, our Clubs offer enriching summer programming that instills confidence and prepares kids for a successful school year. June through September is a critical time for our members, and summer learning loss is one of their biggest challenges. Summer learning loss can stack up year over year, causing low-income children to fall further and further behind academically, ultimately endangering their chances of high school graduation. Unequal access to summer learning opportunities can explain more than half of the achievement gap between lower- and higher-income youth. When you support BGCB, you are investing in happier summers that empower Boston’s youth to achieve great things come September – and beyond. On August 3rd, all 11 of our Clubs plus The West End House and Boys & Girls Clubs of Dorchester came together to compete in games and have fun. Thanks to the Boston Police Department, New England Revolution, and Special Olympics MA for making the day unforgettable! The Greenway once again hosted our Clubs this summer for fun outdoor activities, including visits to their public art exhibits, a ride on the carousel, and lunch at a food truck! A total of nine BGCB groups had a blast exploring the city. The Himmel Hospitality Group set up a day of touring the farm, picking blueberries, and a Health360 approved lunch! Members learned about health and wellness and the benefits of fresh produce.